JC9789. Quartz. Sweetwater mountains, Mono county, California. 3 x 8 cm 55g. $5.00. Collected in 1996 from high up on the Sweetwater mountains plateau. Low temperature epithermal quartz veins in altered andesites. Not in mindat as self collected. Obscure location with unusual quartz groups. Most crystals have a partial secondary coating of micro-crystalline drusy quartz. JC9509. Quartz, siderite, magnesite. Morro Velho mine, Nova Lima, Minas Gerais, Brazil. 5 x 8 cm 106g. $98.00. Tan siderite crystals with clear quartz crystals. A 3 cm wide magnesite crystal is on the front or backside, depending on orientation. It has little speckles of what looks like inclusions of pyrrhotite. A few other bladed magnesites are also present. One of the quartz crystals has a long, flat inclusion of an unknown mineral, this can be seen in the photos below (hematite?). The quartz crystals are clear and gemmy. JC9509. The magnesite is front center in this photo. The inclusion in the quartz crystal is easily visible in the left most quartz crystal. JC9509. Close up of the inclusion. JC9377. Amethyst. Piedra Parada, Municipio De Tatatila, Veracruz, Mexico. 8 x 13.5 cm 329g. $175.00. Lilac crystals on a matrix coated with microcrystalline drusy quartz. I picked this one because of the number of doubly terminated crystals on it. I counted 7. Displays well. The largest crystal on the far back measures 7 cm long. JC9378. Amethyst. Piedra Parada, Municipio De Tatatila, Veracruz, Mexico. 9 x 11 cm 173g. $175.00. This one is nearly all quartz with a thin partial layer of slightly rusty looking matrix. Sticking up from the clear quartz crystal coated matrix are seven +, light amethyst crystals, the longest at 4 cm on the left side. Pretty and displays well. JC9222. Amethyst. Gobobosed mountains, Brandberg area, Erongo region, Namibia. 4.8 x 6 cm 238g. $65.00. Single, fat, light amethyst crystal on matrix. Nice luster on front faces. JC9019. Amethyst. Goboboseb mountain, Brandberg, Namibia. 4.5 x 6 cm 69g. $70.00. Small grouping on matrix. Smaller crystal is lighter amethyst, while larger crystal is a bit darker, with nice purple color. Three crystals all together. JC8923. Quartz (amethyst). Pampa Blanca, Castrovirreyna province, Peru. 17 cm tall. $50.00. A not terribly bright, but interesting quartz crystal from this area. These came out a few years ago, and appear to have been a one time find. 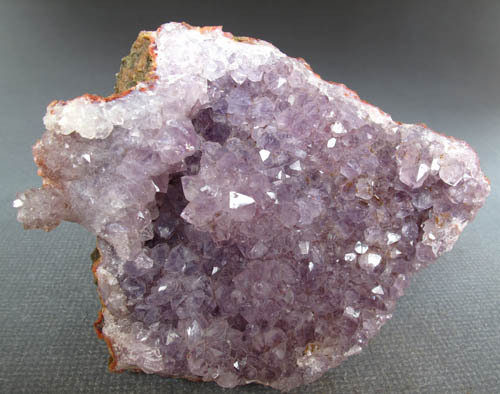 The termination area is a light amethyst in color. These are crude scepters, and on this one, from the front you cannot tell its a scepter...then when you see the back, it is obvious, as seen in the photo below. JC8923. Back side showing the scepter. JC8923. The reverse end of the crystal is weirdly terminated and has a bit of chlorite included giving it a greenish tint. JC8924. Quartz (amethyst). Pampa Blanca, Castrovirreyna province, Peru. 18cm tall. Doubly terminated. $75.00. A not terribly bright, but interesting quartz crystal from this area. These came out a few years ago, and appear to have been a one time find. 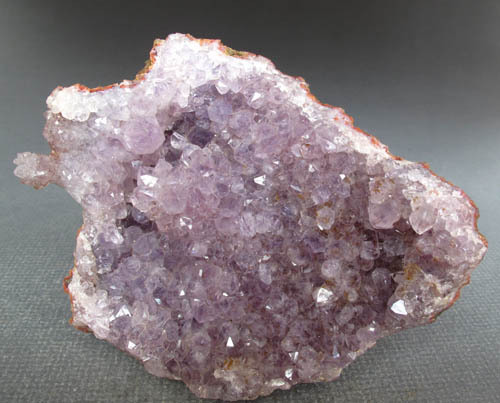 The termination area is a light amethyst in color. These are crude scepters, and on this one, from the front you cannot tell its a scepter...then when you see the back, it is obvious, as seen in the photo below. JC8924. View of the back side showing the overgrowth of the light amethyst on the original doubly terminated crystal. JC8903. Quartz, goethite, microcline. Pikes Peak (batholith? ), El Paso county, Colorado. 9 x 9 cm 520g. $100.00. This is an oldie, originally in Mihelcic collection and then Mike Grobin collection or vice verse; Label has it as Pikes Peak, and it is just enough different, that the label is probably accurate. An odd looking quartz crystal group with goethite sprays growing on it. Looks different from anything I've collected in the Crystal Creek area where most of this type of specimen comes from these days. JC8898. Quartz, dolomite. Renison Bell mine, North Dundas, Zeehan district, West Coast municipality, Tasmania, Australia. 7 x 8 x 14 cm >1000g. $150.00. 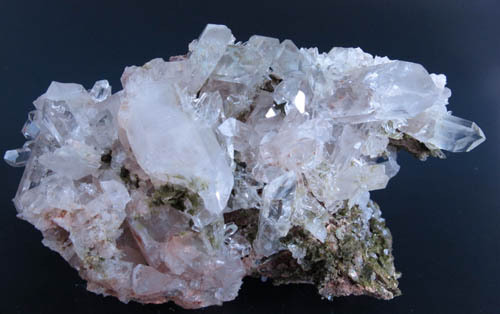 A floater specimen composed of dolomite with quartz crystals all around. Neat specimen from this Australian tin mine, which rarely produces good specimens. JC8895. Quartz (pale amethyst). Morococha district, Yauli province, Junin department, Peru. 13 x 14 cm >1000g. $150.00. Three broken crystals, otherwise in good shape. satiny luster, pale amethyst; a limited number of these came out about 10 years ago. JC8896. Quartz epimorph after fluorite. Sidi Rahal, El Kelaa des Sraghna province, Morocco. 7 x 8 x 16 306g. $175.00 A shell of quartz showing the obvious shape of the fluorite. Unusual specimen from this locality. JC8839. Quartz, with amethyst, and Japan law twin quartz, pyrite. Fengjiashan (Daye copper) mine, Daye county, Huangshi prefecture, Hubei province, China. 7 x 10 cm 289g. $375.00. An unusual specimen from here. On one end is a Japan law twin of white quartz, and on the other side is a amethyst crystal. A few pyrite cubes mixed in. JC8839. A view of the amethyst on the left end, and the Japan law twin on the right end. JC8839. Another view, with the amethyst in the front and the Japan law twin on the end (upper left). JC8839. Another view, with the amethyst on the upper right and the Japanese twin on the bottom. JC8839. Close up of the Japanese twin of quartz. JC8839. Another view, with the amethyst on the bottom left and the Japanese twin on the top center. JC8816. Quartz. Hot Springs blowout, nr. Adam peak, east side Osgood mountains, Potosi district, Humboldt county, Nevada. 5 x 7 cm 160g. $18.00. These quartz crystals come from an old, and long since dormant hot spring occurrence on the east side of Adam peak. Originally it was open to the air, and specimens could be collected from down in the throat of the dried up spring. Many crystals were sand blasted on one side, where sand laden water surged against the crystals and literally rounded them off over time. The occurrence is now filled in and any remaining crystals are deeply buried. These are a few examples of specimens from this rather unique occurrence. Collected about 20 years ago. JC8818. Quartz. Hot Springs blowout, nr. Adam peak, east side Osgood mountains, Potosi district, Humboldt county, Nevada. 3 x 5 cm 55g. $30.00 A floater group of doubly terminated crystals, milky to pale smoky. 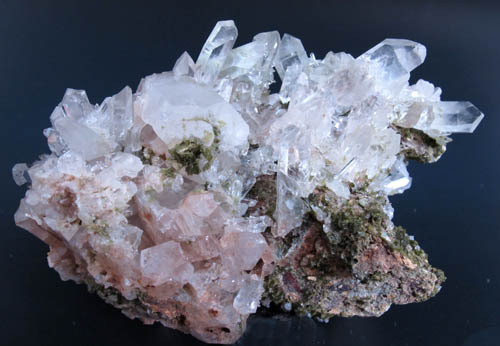 These quartz crystals come from an old, and long since dormant hot spring occurrence on the east side of Adam peak. Originally it was open to the air, and specimens could be collected from down in the throat of the dried up spring. Many crystals were sand blasted on one side, where sand laden water surged against the crystals and literally rounded them off over time. The occurrence is now filled in and any remaining crystals are deeply buried. These are a few examples of specimens from this rather unique occurrence. Collected about 20 years ago. JC8819. Quartz. Hot Springs blowout, nr. Adam peak, east side Osgood mountains, Potosi district, Humboldt county, Nevada. 5 x 6 cm 91g with stand. $30.00. A doubly terminated crystal, a little crude in shape. These quartz crystals come from an old, and long since dormant hot spring occurrence on the east side of Adam peak. Originally it was open to the air, and specimens could be collected from down in the throat of the dried up spring. Many crystals were sand blasted on one side, where sand laden water surged against the crystals and literally rounded them off over time. The occurrence is now filled in and any remaining crystals are deeply buried. These are a few examples of specimens from this rather unique occurrence. Collected about 20 years ago. JC8822. Quartz. Hot Springs blowout, nr. Adam peak, east side Osgood mountains, Potosi district, Humboldt county, Nevada. 5 x 7.5 cm single crystal. 220g. $20.00. These quartz crystals come from an old, and long since dormant hot spring occurrence on the east side of Adam peak. Originally it was open to the air, and specimens could be collected from down in the throat of the dried up spring. Many crystals were sand blasted on one side, where sand laden water surged against the crystals and literally rounded them off over time. The occurrence is now filled in and any remaining crystals are deeply buried. These are a few examples of specimens from this rather unique occurrence. Collected about 20 years ago. JC8541. Quartz (orange). 2nd Sovetskii mine, Dal'negorsk, Kavalerovo mining district, Primorskiy Kray, Far Eastern region, Russia. 5.5 x 10 x 4 cm high. $300.00 A white coating on orange crystals. Common for a while, these have pretty much disappeared from the market. ON SALE, TAKE 20% OFF THE MARKED PRICE. JC8158. Quartz, schorl. David Ost, Erongo mountains, Namibia. 6 x 7 cm 144g. $75.00. A stout scepter on white quartz with a schorl crystal on the back side. ON SALE, TAKE 20% OFF THE MARKED PRICE. JC8158. Another view. The white quartz stem of the scepter is visible. JC8154. Hubnerite, quartz. Mundo Nuevo mine, Mundo Nuevo, Huamachuco, Sanchez Carrion province, La Libertad department, Peru. 5 x 7.5 cm 12k6g. $90.00. A couple of stout hubnerite crystals have grown on the base of this quartz cluster. Looks like a floater group. ON SALE, TAKE 20% OFF THE MARKED PRICE. JC8030. Quartz (smoky, amethyst). Minas Gerais, Brazil. 5.5 x 9 cm 87g. $50.00 A flattened crystal complex, light smoky with amethyst tints here and there. Wish I had a more exact location. ON SALE, TAKE 20% OFF THE MARKED PRICE. JC8011. Quartz. Zhob district, Baluchistan, Pakistan. 5 x 6.5 cm 121g. $25.00. Double terminated crystal. Interesting specimen. Not too many specimens have come out of this location. JC7981. Quartz. Cerro Quesgar (Cantera Quesgar; Cerro Quesge), Ancash department, Peru. 9 x 10 cm 500g. $65.00. There is one broken crystal on the top edge of the specimen. Otherwise a pretty good group. ON SALE, TAKE 20% OFF THE MARKED PRICE. JC7929. Quartz, chalcopyrite. Animon mine, Huaron mining district, Huayllay district, Pasco province, Pasco department, Peru. 6 x 9.5 cm 91g. $20.00. Sparkly, clear, colorless quartz with a few scattered chalcopyrite crystals. ON SALE, TAKE 20% OFF THE MARKED PRICE. JC7784. Quartz (faden). Minas Gerais, Brazil. 5.5 x 7 cm 80g. $75.00. Floater group, doubly terminated crystals. The faden line can be seen going down the middle of the group. Sharp group. ON SALE, TAKE 20% OFF THE MARKED PRICE. JC7763. Quartz, galena. Animon mine, Huaron district, Huayllay district, Pasco province, Pasco department, Peru. 3.5 x 7 cm 216g. $120.00. This one is unusual with two nice scepters; quite unusual from this location. The galena is typical for the Animon mine. ON SALE, TAKE 20% OFF THE MARKED PRICE. JC7724. Quartz (faden). Hot Springs, Arkansas. 6 x 7.5 cm 92g. $75.00. Very unusual from Arkansas are these faden quartz. Sharp crystals. ON SALE, TAKE 20% OFF THE MARKED PRICE. JC7724. Another view. The faden line can be easily seen going up the center of the group. JC7651. Quartz Japanese twin, calcite. Rosario Mabel mine (La Flor del Peru II) Gato Moro mountain, Pampa Blanca, Castrovirreyna, Huancavelica dept., Peru. 4 x 6.5 cm. 44g. $85.00. This piece has a nice Japanese twin on one end. Unusual in that the calcite has not been etched off as is usual from the specimens from here. Nice bright and clear twin. Side view here. ON SALE, TAKE 20% OFF THE MARKED PRICE. JC6055. Quartz. Advance Mine (Zaca Mine; Zaca group; North Advance Mine; Colossus Mine; Colorado No. 2 Mine; Tarshish Mine), Colorado Hill, Loope (Monitor; Loopeville), Monitor - Mogul District, Alpine Co., California. 7.5 x 11.5 cm 312g. $25.00. A double set of vugs (lithophysal cavities) in the altered rhyolite. ON SALE, TAKE 20% OFF THE MARKED PRICE. JC6055. Close up of the left hand vug. JC6055. Close up of the right hand vug. JC6061. Quartz. Advance Mine (Zaca Mine; Zaca group; North Advance Mine; Colossus Mine; Colorado No. 2 Mine; Tarshish Mine), Colorado Hill, Loope (Monitor; Loopeville), Monitor - Mogul District, Alpine Co., California. 4 x 8.5 cm 163g. $15.00 ON SALE, TAKE 20% OFF THE MARKED PRICE. JC2227. Quartz. Advance Mine (Zaca Mine; Zaca group; North Advance Mine; Collosus Mine; Colorado No. 2 Mine; Tarshish Mine), Colorado Hill, Loope (Monitor; Loopeville), Monitor - Mogul District, Alpine Co., California. 5 x 10 cm 229g. $10.00. A vesicle in altered rhyolite filled with small crystals on drusy quartz. Collected about 2000. ON SALE, TAKE 20% OFF THE MARKED PRICE. JC2229. Quartz. Advance Mine (Zaca Mine; Zaca group; North Advance Mine; Collosus Mine; Colorado No. 2 Mine; Tarshish Mine), Colorado Hill, Loope (Monitor; Loopeville), Monitor - Mogul District, Alpine Co., California. 6.3 x 7.5 cm 180g. $15.00. A vesicle in altered rhyolite filled with crystals on drusy quartz. Collected about 2000. ON SALE, TAKE 20% OFF THE MARKED PRICE. JC2231. Quartz. Advance Mine (Zaca Mine; Zaca group; North Advance Mine; Collosus Mine; Colorado No. 2 Mine; Tarshish Mine), Colorado Hill, Loope (Monitor; Loopeville), Monitor - Mogul District, Alpine Co., California. 6.3 x 16 cm 180g. $15.00. A vesicle in altered rhyolite filled with crystals on drusy quartz. Collected about 2000. ON SALE, TAKE 20% OFF THE MARKED PRICE. JC2222. Quartz. Zaca mine. Colorado Hill, Loope, Monitor-Mogul district, Alpine county, California. 7.5 x 7.5 cm 109g. $18.00 Vug in silicified rhyolite filled with tapering quartz crystals. ON SALE, TAKE 20% OFF THE MARKED PRICE. JC2225. Quartz. Zaca mine. Colorado Hill, Loope, Monitor-Mogul district, Alpine county, California 5 x 9 cm 178g. $20.00 Vug in silicified rhyolite filled with tapering quartz crystals. ON SALE, TAKE 20% OFF THE MARKED PRICE. JC6910. Quartz, dolomite? Ohio mine, Ouray county, Colorado. 6 x 8.5 cm 149g. $25.00. Collected in 1987 by Gene Tribbey. ON SALE, TAKE 20% OFF THE MARKED PRICE. JC6856. Amethyst. Sidi Rahal, Bou Azzer, Atlas mountains, El Kelaa des Sraghna province, Morocco. 8 x 10.5 cm 203g. $30.00. Light purple amethyst in a partial geode. There is a finger of amethyst sticking up from the left upper corner. Hard to see in a 2 dimensional photo. Two views are shown. ON SALE, TAKE 20% OFF THE MARKED PRICE. JC6672. Quartz, epidote. Nascio, Val grareglia, Chiarari, Genova prov., Italy. 7 x 9 cm 231g. $35.00. The epidote occurs as micro crystals on the matrix. ON SALE, TAKE 20% OFF THE MARKED PRICE. JC2916. Amethyst. Piedras Parado, Mun. De Professor Rafael Ramires (Las Vigas), Veracruz, Mexico. 5 x 7.5 cm 64g. $150.00. A lovely group of midrange color amethyst, collected in 2004.